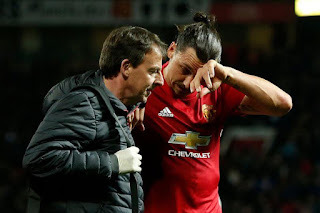 Zlatan Ibrahimovich is injured and out for 9 months, and Manchester United have declined a contract extension for him after a horrific knee injury. The Red devils however have extended their full medical support in his year-long fight to save his career. The talismanic Swedish striker is expected to be sidelined for almost a year after rupturing knee ligaments in Thursday night’s Europa League clash with Anderlecht. Unfortunately for Ibra United will now withdraw their offer to trigger an extra one-year contract despite scoring 28 goals for the club. Some feel the striker has played his final game for the club, who in return for his outstanding season feel they have a duty of care to oversee his rehabilitation, until his contract expires in the summer. Ibrahimovich who currently earns £300,000-a-week at United, had been waiting to see if the club would make it through to the champions league. The devastating blow seems to have marked an end to his Manchester United career.